Who knew a married woman could feel like a single mom? Bookstore shelves are full of parenting resources for single moms. But where do moms turn if they feel like a single parent—but they’re not? Whether he is away on business, deployed in the military, or obsessing over a hobby, families face unique and difficult challenges when dad is unavailable. Moms who parent in these situations need help and don’t necessarily relate to the advice given in divorce recovery or single parenting resources. Married Mom, Solo Parent is a common-sense, down-to earth look at the struggles wives and mothers face when their husband is not actively involved in family life. Writing from her own experience as a “married solo mom”, Carla Anne addresses tough questions such as: How do I overcome loneliness, insecurity, and anger? How do I raise kids to honor a father who’s not around? How do I avoid emotionally checking out of my marriage? How do I find some time just for me? With practical suggestions, anecdotes, and biblical teaching, this book encourages moms to see their position as a high calling, to find healing amidst their worries and frustrations, and to tap into God’s strength for help in facing the daily challenge of being a married mom, solo parent. Married Mom, Solo Parent was released October 2011. Whether you plan to read alone, with a friend, or in a small group there’s a companion resource designed for you! The Personal Reflection Journal and Small Group Study Guide are available for personal use free of charge. ForeWord Reviews identified Married Mom, Solo Parent as one of their Book of the Year Award Finalists and one of the top parenting books of the year! The Word Guild honored Married Mom, Solo Parent with two awards of merit in their June 2012 Canadian Christian Writing Awards. The awards were presented for the categories of culture and relationships. Flamingnet has honored Married Mom, Solo Parent with their Flamingnet Top Choice Award. Focus on the Family has reviewed Married Mom, Solo Parent and has stamped it with their “Focus Reviewed” stamp of approval! It’s available for purchase through the Focus on the Family store here. Nicole at Wyoming Girl Turned Coastie Wife There are few books that I’ve read that have actually impacted me to the point of changing my life and thinking. In fact other than the Bible I can only think of three other books that have done this for me–this book is that kind of a book! Kendra at Happily Managing a Household of Boys I really enjoyed this book! Carla Anne is a brand new author and she really “hit a home run” with this book. I have never seen a book based on this topic and this book really opened my eyes to what some Moms have to struggle with to keep their family “going”. I was really amazed at how many different reasons a dad can be an “absentee husband”. I think the most common ones many think about are a husband who travels a lot or one works long hours. I really like the practical, biblical and wise advice that Carla Anne gives to the Moms struggling with the fact that their husband is “there but not” or away for long periods of time. The book has many, many suggestions and practical advice for dealing with an “absentee husband”. A really great part of the book is where the author talks about honoring the husband even through our own anger and frustration. Julie Arduini at The Surrendered Scribe She took what was her life—a busy, sometimes frustrating, and always challenging way of living and made it a ministry. Now she’s releasing a book that is the first of its kind, at least the first I’ve ever seen. Married mom, single parent. Yes. Carla explains in her book Married Mom, Solo Parent that this is a real demographic that needs its own encouragement and resources. Whether your husband is serving in the military, travels a lot for work, has a crazy work schedule that keeps him preoccupied, or even home but obsessed with things like computer games, you remain at home, still married, but stepping up to take care of all parenting and household matters. The books out there for single parents are usually about divorce and that’s not Carla’s situation or mine. Her book is a breath of fresh air for moms in this special niche that so many didn’t see coming when they first married. Tammy at Bluerose’s Heart I really thought I needed this book. After reading it, I KNOW I needed it! I can honestly say this has been a life changing read for me. Christie at Blessed Life Carla gives wonderful, practical and biblical advice to us moms who struggle with being a solo parent. She shows moms how to rely on God for strength and also gives excellent advice for dealing with life as a solo parent! Hayley at Hanging Off The Wire This book can be read chapter by chapter, or just read the parts you think pertain to you. I especially like the parts about pride, and anger, and discipline divided. The book is chock-full of good advice, and I love the “Meet Mom” parts, that share personal stories of real moms in these situations. This book is worth the read, even if you don’t feel like a solo parent! Mary Ann at A Mom With A Blog Carla addresses these issues and many that I didn’t even realize I had, and she does so with a heart to help you turn your own heart to God and honor your husband. Anna at The Cross Is All Carla Anne Coroy speaks the language of solo Moms everywhere. 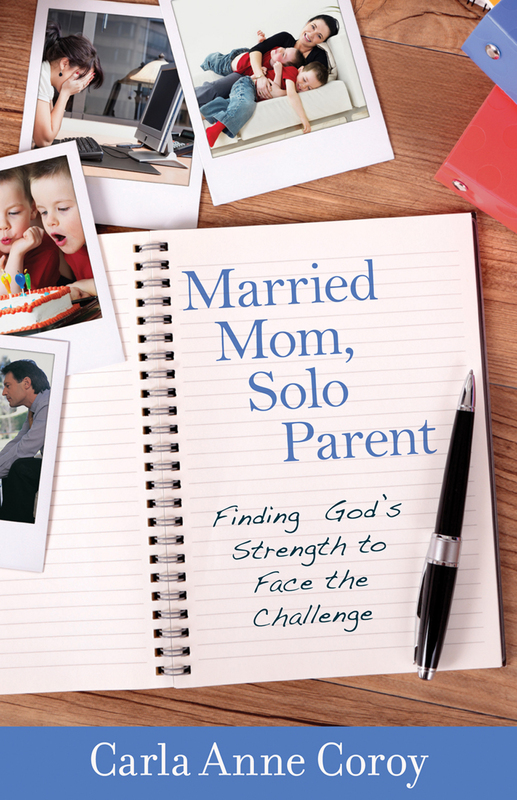 Her new book, Married Mom, Solo Parent: Finding God’s Strength to Face the Challenge is at times heartbreaking, at times humorous and is at all times pointing to God’s strength and power. Whatever situation a married solo Mom faces, Mrs. Coroy has words of wisdom for her and something of value to add to her life. Katy at A Few More Pages This book gave me a lot to think about. I’ve got a lot of sticky notes marking important passages that I plan to go back to on a regular basis. I am really glad I read this book. It has helped me to look at my husband from a new perspective and has forced me to think about making my actions and my attitudes good examples for my kids. I want them to be able to look at our family as something they want to emulate, not reject. The best way for me to do that is to lean on God’s strength, because when I depend too much on my imperfect and weak self, it doesn’t go that well. I highly recommend this book for any married mom who finds herself struggling to do the solo parenting gig for whatever reason. You’ll find a lot of great support and advice within these pages. Pattie at Fresh Brewed Writer Carla Anne pulls no punches. She is honest, very honest in a way that is not off-putting but definitely needed when dealing with difficult issues like emotional divorce and infidelity, honoring her husband, and parenting issues like discipline. I think this book is a much-needed resource for women who find themselves parenting mostly by themselves. Christine at The IE Mommy I think Married Mom, Solo Parent is a must-read for any new-bride or mom and the old-timers, like me. It’s refreshing, open and enjoyable. There are little bits of nuggets and wisdom that will help you understand and appreciate your situation a little bit more within the pages of this book. Kristin at Impatiently Wishing on a Star The title may read ‘Married Mom, Solo Parent’ but I feel this book is for every woman: single, married, kids, no kids. I took alot from this book, in fact there are few pages that aren’t marked with my highlighter. I learned not only how to deal with my situation at hand but how to talk to God, how to be a better parent, friend, wife, sister, daughter, etc. In reading this book I realized things about myself, things that I was doing or thinking that were hindering my relationship that I never even thought would be an issue. I’m excited to see the changes that will soon take place in me, in my home. This is a fabulous book. I’ve already promised my bestie she could borrow it and I know it will benefit her greatly as well. Faith at The Non-Religious Christian This book is for those who have tried everything short of divorce, because they happen to believe that God offers something higher than escape from such a marriage. With tenderness and grace, Carla puts that “something” well within reach, in a refreshing and surprising way. Adhering fiercely to Biblical standards for marriage, Carla gives readers permission—not to settle for an apathetic coexistence—but to unapologetically honor the husbands God gave them, and to expect to thrive in the process. And she shows them how. Athena gives a military mom’s perspective at Our Crazy Life I had no idea that I was ‘chosen’ to review this book because I needed it so desperately. Through the good, the bad and the ugly, Carla Anne Coroy takes you through step by step and asks (and answers!) the really tough questions that we are all afraid to ask. She isn’t the perfect woman telling you what you should be doing, but the one willing to share her story – mistakes, hurts and all. . . . If your husband is in the military and deploying or training for long periods of time or he works away from home a lot or even if he has just ‘checked out’ of his roles as husband and father, this book is for you. You won’t regret reading it and you may just finish with a new perspective and a changed attitude. I did. Brittany at The Trucker Wife Digging into the first chapter of her book made me feel like there were other woman like me out there experiencing very similar things. The second chapter made me feel like she had video cameras in my house and had hardwired my brain because everything she spoke about I completely understood and had experienced in one way or another. . . . This is not a book I see just sitting on the shelf after reading it. It will be a book I continuously refer to for inspiration, help, and direction on our journey. Sherri at Flamingnet.com Married Mom, Solo Parent by Carla Anne Coroy does exactly what its sub-title states: it helps you to find God’s strength to face the challenge of being a married mom while also being a solo parent. . . . a well-written book that is sure to help many women keep their sanity and their marriages intact. I highly recommend Married Mom, Solo Parent by Carla Anne Coroy! Just can’t afford another book right now? You can read some of the book here for free!